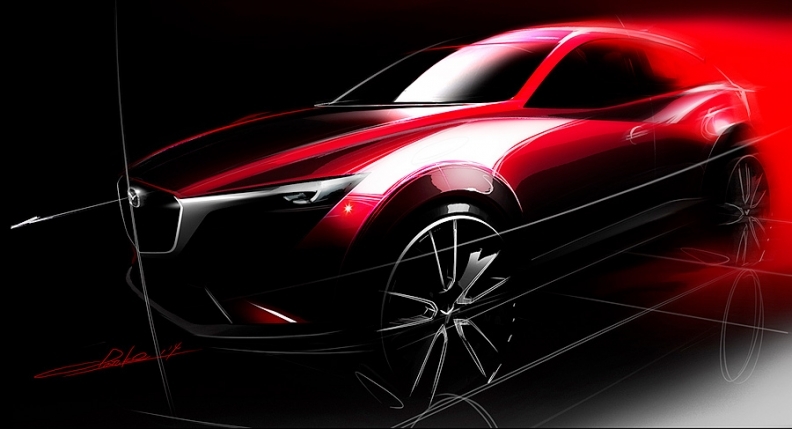 The CX-3 will combine Mazda's swoopy Kodo design language with cues from the SUV world. SAN FRANCISCO -- Mazda Motor Corp. wants a piece of the market for miniaturized crossovers. Next month at the Los Angeles Auto Show, the Japanese automaker plans to unveil its rival for models such as the Nissan Juke, Buick Encore and Subaru XV Crosstrek: a high-riding subcompact called the CX-3. Mazda today released a teaser sketch of the CX-3, which shows the new model will combine Mazda’s swoopy Kodo design language with cues from the SUV world, such as an upright ride and thick wheel arches. Positioned beneath the CX-5 and CX-9 in Mazda’s lineup, the CX-3 is scheduled to go on sale in mid-2015, sources told Automotive News earlier this year. Riding on the same platform as the redesigned Mazda2 hatchback, the CX-3 is expected to be powered by a 2.0-liter Skyactiv gasoline engine. Mazda also revealed today that the updated Mazda6 mid-size sedan and CX-5 compact crossover will make a world debut in Los Angeles. Both will get a new front fascia and interior for the 2016 model year, including new instrument clusters, more premium materials and a version of the infotainment system already offered in the Mazda3 compact car.